I decided to change up how I’m doing my review roundups of the comp books this year. Instead of big mass roundups, I’m dividing them into the stores where they were purchased. This should mean I’ll have a large grouping of reviews (Staples, CVS, Walgreens, Walmart, etc…) instead of 2 or 3 large unwieldy slow loading reviews. So saddle up, as the second installment we have CVS. When I stopped by CVS this time, they were just setting up their Back to School display, it wasn’t fully fleshed out and nothing was yet on sale. Their sales are usually pretty terrible so I’m not holding out for the prices to get much better. Let me start off with the good about this comp book- the paper is superb. It doesn’t have the smoothness of last year’s but it holds its own. All my pens performed flawlessly. From fountain pen to ballpoint to pencil, everything felt great on the paper. 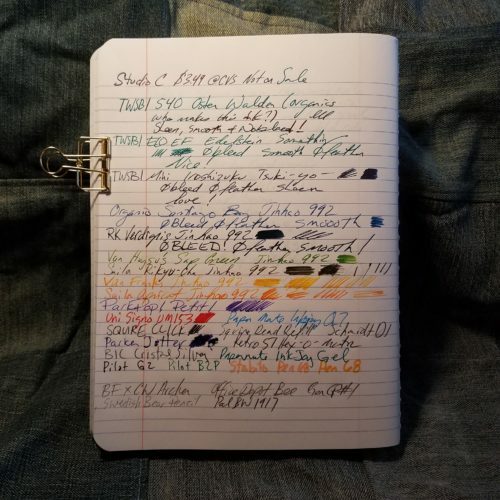 All my inks that sheen has fabulous Tomoe River level of sheen, and not a speck of bleed or feathering. There is just enough tooth that pencil feel awesome but doesn’t get ground to a stump when writing a line. The pale blue ruling fades to the background. Overall this book is a winner. 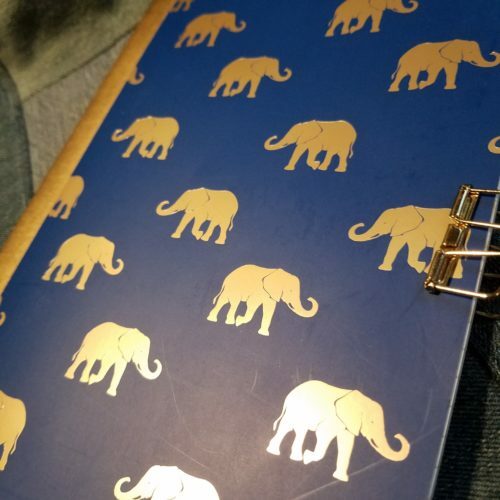 Getting one at a discount price will just be gravy on an already superior composition notebook. The bad part of these is that this year’s selection is tacky AF. I’m sorry but some of the covers were terrible. 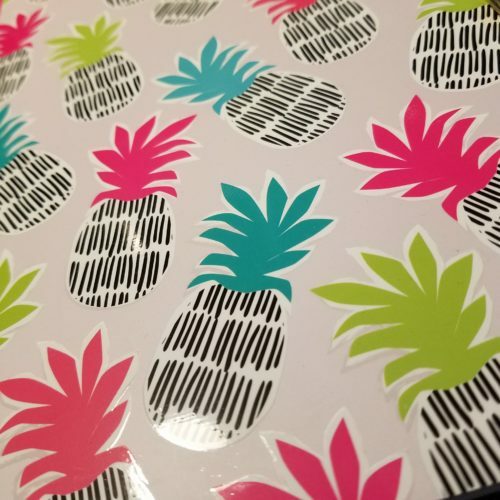 I picked out a bright glossy pineapple design which was the nicest on the shelf. The rest were awful. We’ll see what Walgreens has to offer. Last year’s cute woodland creatures were the best. 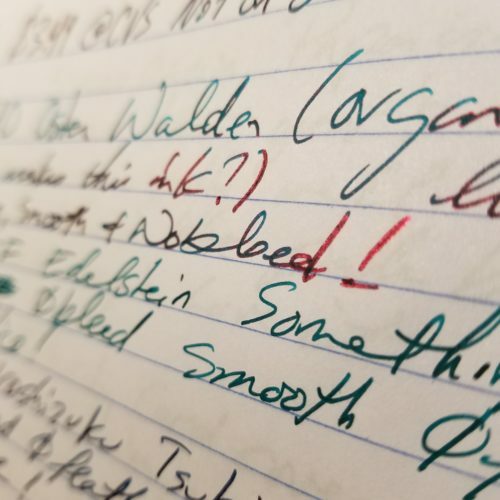 The paper in this comp book is stunning and a surprise. Last year’s version of the UStyle comps was awful, like toilet paper soaking ability. 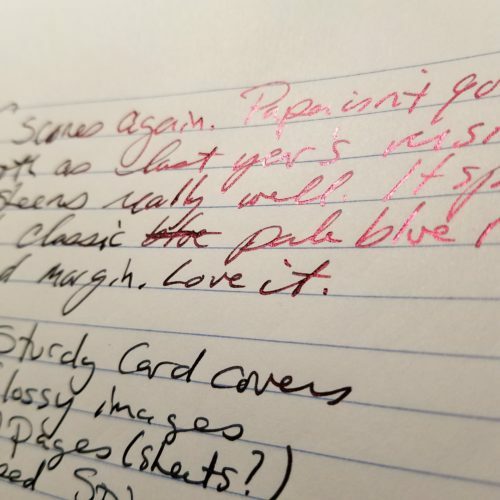 But this year’s has a silky smooth paper that responds well to even my worst ink (Looking at you RK Verdigris) Inks that sheen, have an amazing sheen and every nib feels smooth and buttery on this paper. Not quite skating like on Tomoe River, but smooth and very nice. 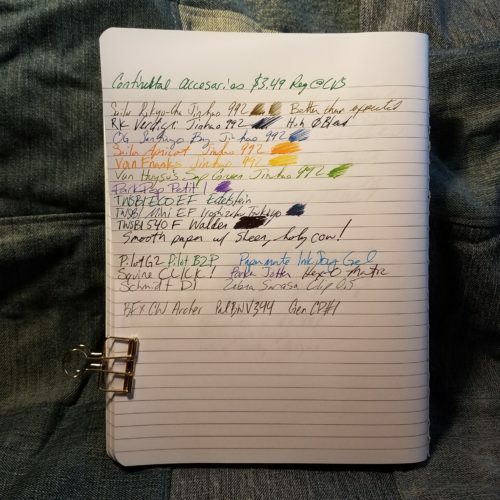 Pencil and all of my other pens felt lovely on the page. 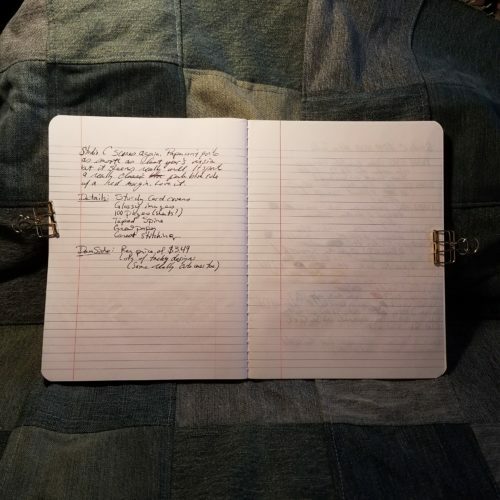 Not one ink or pen exhibited feathering or bleed through. 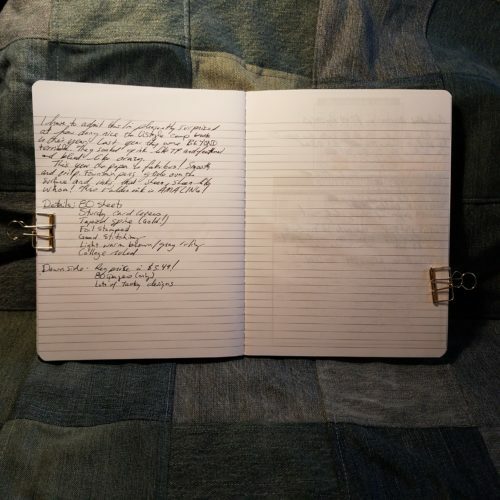 Despite the paper being thin, you could use both sides of the page! I really dig the pale warm brownish gray ruling. It’s different but not so off that you give it a lot of attention, just different enough to be noticed. 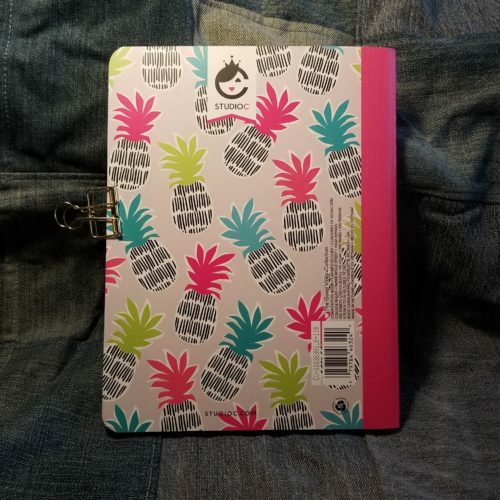 The covers are thick and sturdy enough that you can fold it over on itself and write in hand. Overall this is a killer comp book. 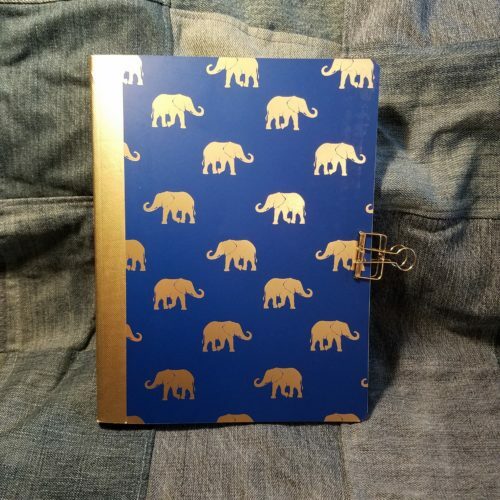 The one downside is the covers, some of the designs were quite nice, case in point the gold foil elephants on a navy background that I scored. Alongside that were plenty of awful animal prints with garish gold foil elements. 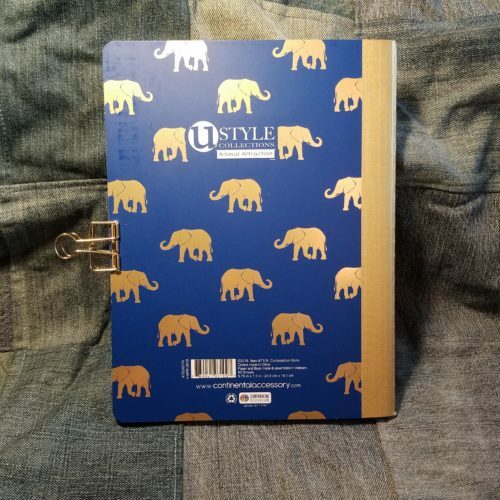 These two brands don’t represent the best deals of the composition notebooks available, but they represent some of the best paper available. If you keep an eye out for the sales CVS offers you will certainly end up with some great deals on these. Keep an eye out for their clearance section after BTS is done often my local CVS* often has things on ridiculous clearance prices as soon as the “season” is over. 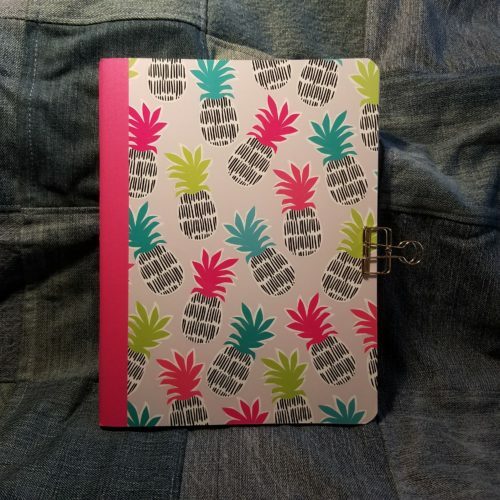 This entry was posted in Review and tagged cheap, comp books, composition books, CVS on 20180809 by leslie.